6th qualifying match of CLT20 2014 was played between Mumbai Indians and Northern Knights at Shaheed Veer Narayan Singh International Stadium, Raipur. Northern Districts go through group stage without losing any game in qualifying round as today registered easy win over Mumbai by 6 wickets with 16 balls remaining. SB Styris (Northern Districts) declared man of the match for his 3 wickets of 21 runs in his 4 overs. Earlier Districts won the toss and chose to field first and let Mumbai to set target. Mumbai batsmen could not bated well and managed to put small score of 132 runs in very important match. Skipper KA Pollard played some good inning and contributed 31 runs of 24 balls. In later overs S Gopal (24 of 12 balls) and SL Malinga (20 of 8 balls) played quick cricket for Mumbai. TG Southee and SB Styris picked up 3 wickets each for Express. Following target of 133 runs, District got very good start with AP Devcich and KS Williamson both added 83 runs before Devcich got out scoring 39 runs. KS Williamson also contributed 53 runs before lost his wicket. Districts registered easy win in 17.2 overs having lost 4 wickets and remain top of table in Qualifying Round. 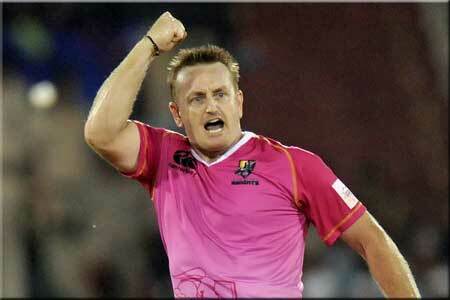 SB Styris (Northern Districts) declared man of the match for his 3 wickets of 21 runs in his 4 overs.